I have come to understand that being burned out doesn't necessarily leave ashes behind. The only thing I have behind me is a cat. And a behind. But oh, how tired I am. Spent a most excellent Saturday at Toronto International Speedway with Sweetie Girl Racing and Anna He, which oddly enough is in Cayuga. Don't ask. I do not know. But taking a really fun Mazda 3 onto the race track was a blast; letting a 16-year-old girl do it - with me in the back seat - was even better. Story to run in the future. Thank you, Sarah. You rock. It would appear summer has finally arrived. Thank whoever. Geez, it took forever to get here. I just looked outside to see if Christer has put out my planters, as he assured me he would do today. Yeah, right. Sigh. I spent yesterday sitting in the sun in lovely rural Dunnville, wearing a dress and a straw hat and sipping wine. Yeah, it was just that nice. I highly recommend it. Well, maybe not Dunnville. They have bridgework going on and you have to wait forever at the light. Conversation reeled around as it always does, from toads to movies to writing to cars to turkeys. 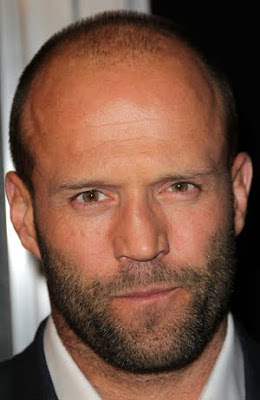 I found myself trying to make my case for my luv of the follicaly challenged, and realized the only way to win was to pull out Jason Statham. Lemme know, ladies. I found this pic tonight and figured it was a sign to post it. Yer welcome. Absolutely agree! My boyfriend introduced me to the swarthy Mr. Statham in The Transporter. He thought he was getting a 'guy' movie in, completely unaware that I was quite taken with the star and had no problem a little later giving in to Transporter 2, over some chick flick I can't even remember. Just watched The Expendables last weekend....I could watch him in pretty much anything. He is hot...no doubt about it! Maybe there's hope for me yet. My vote goes to Corey Stoll of Law and Order: Los Angeles.